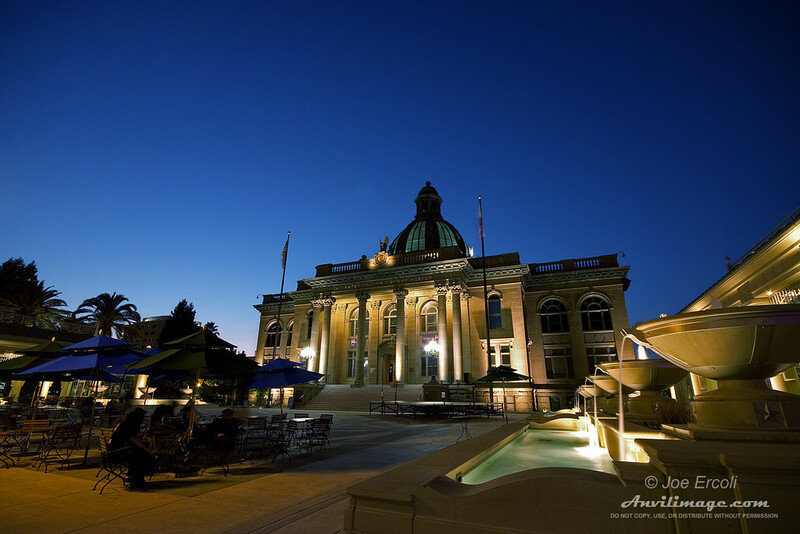 Redwood City Courthouse, original photography by Joe Ercoli. I remember my first cell phone pics, fuzzy and grainy yet still enough to capture a memory of time and place. Some cell cameras are getting pretty good and the iPhone is one of them. While on my motorcycle most of the time, I try to travel pretty light and can’t bring my camera everywhere with me although I could shove a little point and shoot into a pocket of my backpack. Call me lazy, but my cell phone camera does the job well enough. One night after the gym I was walking through downtown Redwood City and spotted the sun setting behind the old (and newly restored) courthouse building. The colors were wonderful and I pledged to myself that I would make the effort to get back down here one evening with my camera and tripod in hand. To capture the memory I quickly pulled out my iPhone and snapped a shot to remind myself later. 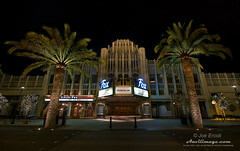 The Fox TheatreA couple weeks later Paul, Tom and I descended on down town invading the square with our gear snapping pics everywhere. There’s actually a lot of cool stuff down here – buildings, the fountains, the old Fox Theatre across the street and the neon lights of down town. We spent a couple hours down there shooting and I must have snapped at least 25 pics of the courthouse during the sunset making sure that the light was just right. Like a Boy Scout, always be prepared and try not to miss that opportunity for a photo that you just might miss. This entry was posted on Thursday, August 13th, 2009 at 5:42 pm	and is filed under Blog, Photos. You can follow any responses to this entry through the RSS 2.0 feed.